Pop star turned gardener Kim Wilde has scored a prestigious gold for Cumbria in the Chelsea Flower Show. Along with Richard Lucas she designed a Cumbrian Fellside Garden, which featured wild flowers, dry stone walls and natural slates used as flagstones. It is one of nine "courtyard" gardens which are featured at the world famous flower show. Their entry, created with reclaimed materials, was also voted best in show in the Courtyard Garden category. Ms Wilde created the garden with Mr Lucas, who is head gardener of the Lakeside Hotel in Windermere. She said: "This is genuinely as thrilling as any hit record - for our work to be recognised in this way by our peers is as good as it gets. Richard and I are just delighted." 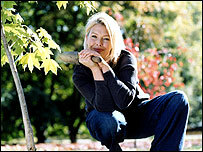 Cumbria Tourist Board based in Windermere has been working with Kim Wilde this year to promote Cumbria's gardens. Eric Robson, chairman of Cumbria Tourist Board, said: "I am absolutely delighted for Kim and Richard as I know they spent a good deal of time creating a perfect Cumbrian Fellside Garden. "This puts the county on the gardening map and sends out a clear message to visitors that Cumbria and the Lake District are a superb place to enjoy majestic, colourful gardens." Ms Wilde said in the introduction to the Cumbria Tourist Board guide that she hoped her garden at Chelsea would "inspire more people to discover and enjoy some of the stunning gardens in Cumbria."